What is an outflow boundary or gust front? The question has come up numerous times the past few times we've had storms in the Mid-South: "What is a gust front / outflow boundary?" On our social media channels, we often refer to these features during nowcasting stints as they are an important part of the life cycle of summertime (especially) storms and can affect you in ways that are noticeable. In the course of a thunderstorm's lifetime, there is birth and death (or generation and collapse). Thunderstorms contain updrafts of wind that push miles into the sky, creating billowing clouds, and downdrafts often associated with falling precipitation. The updrafts also eventually become downdrafts, meaning the air is now rushing back towards the ground. When the rush of air hits the ground, it is commonly called a downburst or microburst and spreads out along the ground (as it can't go through the earth). This creates an outflow of cooler air from the storm (remember the air originates miles up in the sky where it is much cooler). As the outflow propagates away from the parent storm, it creates a boundary between the cooler more stable "outflow" wind and the surrounding air that it is moving into. This is the outflow boundary or gust front (or in storm spotting/chasing lingo, the forward flank downdraft). Because the outflow typically has gusty and turbulent wind conditions, it picks up dust from fields, insects, small children (ok, not really) and any other light objects that can be pushed along with the wind. Doppler radar is able to detect the objects (even dust in large enough quantities) caught up in the outflow boundary, which becomes visible to radar-watchers as a narrow line of light returns (or thin line). Below is a screenshot from StormView Radar taken Thursday night as a large outflow boundary moved across the Memphis metro. Note the green worm-like line labeled with red arrows. Voila - an outflow boundary! The other thing typically detectable by radar along an outflow boundary is low-level clouds. Because two air masses are colliding (the cooler outflow-generated airmass and the warmer surrounding air ahead of the outflow), clouds are generated as the warmer air rises over the cooler outflow air. Rising air promotes cooling and condensation, thereby creating clouds. With the strongest outflows, the type of cloud created is the shelf cloud, aptly named as it typically resembles a shelf in the sky. Below is an approaching shelf cloud along an outflow boundary. This picture was taken in Paragould, AR late yesterday afternoon before it made the long trek to the Memphis metro (same storm system). 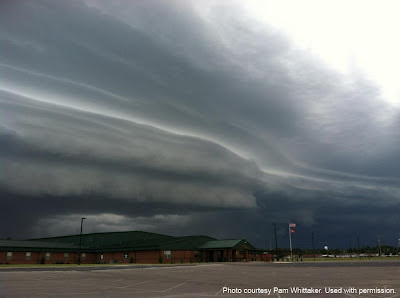 Shelf cloud, photographed by Pam Whitaker. Paragould, AR. It's not unusual to see variations of this cloud type along outflow boundaries. Sometimes they look very sinister, as they are often dark, low, and stretch for miles. However, the clouds themselves usually pose no threat (in fact, many times there is not even rain in them). But if one of these is coming your way, be prepared for gusty wind behind it, blowing from the direction in which the shelf cloud is moving from. You'll also typically notice drops in the temperature, somewhat drier (less humid) air, and often rising pressure. Often the storms that generated the outflow may not be far behind the shelf, so also be prepared for stormy weather! In the case of the outflow depicted on radar above, temperatures dropped about 10 degrees, dewpoints fell 5-6 degrees (hence, drier air), and the wind shifted to the northwest gusting to 30 mph or more. 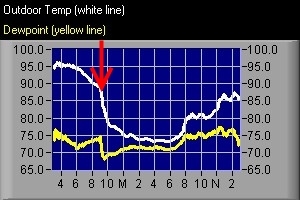 The outflow boundary passed the MWN sensors in Bartlett about 9:30pm. Note the red arrow, indicating the passage of the outflow. Temps fell from the upper 80s to upper 70s and dewpoint fell from 75 to about 68 degrees. Even if the outflow has moved well away from the storms that created it, the rising air along the leading edge of the boundary can often create new storms in the wake of the boundary, hence re-starting the thunderstorm life cycle! Watch the video below to see a time-lapse of an outflow boundary and associated shelf cloud move over Bartlett, TN in June. Last night's storms produced an outflow boundary that moved through the city and now stretches across the north MS metro counties, leaving more stable and slightly less humid air over the northern half of the metro. Thunderstorms will likely erupt again later this morning, especially ahead of the outflow, meaning that north MS will have a better shot at rain than west TN. Severe weather is not a big threat, though a few storms could produce gusty wind. A few showers are still possible in west TN this morning as well. Afternoon temperatures in the metro will generally be in the lower 90s except paces (like some in north MS) that get mid-day rain. As the main "cold front" moves in tonight, no rain will accompany it, however what it will do is bring in drier air for Saturday. While this is good in that the air will be less humid on Saturday, it also means that temperatures could soar under building high pressure. Less humid air is able to heat and cool more readily than moist humid air, so we'll be watching for highs in the upper 90s on Saturday as dewpoints sink into the lower 60s. The net effect is air that actually FEELS like the 90s, rather than 105+. A nice breeze should top it off nicely. Sunday will be similar, with hot temperatures (maybe near 100), but still moderate humidity. The best part of Sunday will be the morning, when low dewpoints mean we should see comfortable sunrise temps perhaps as low as the upper 60s in the suburbs! Get the complete MemphisWeather.net forecast for the metro here. Upcoming weather events for all ages! Mid-Southerners have TWO FREE weather events that they can take part in over the coming week and a half - one for kids (with parents/guardians) and one for all ages! First, this Saturday (July 28) at Union University in Jackson, TN, the Dixie Alley Storm Chase Team, in conjunction with the National Weather Service and local Emergency Management Agencies, will be putting on a regional severe weather workshop that is free and open to the public. DASCCON-1 runs from 8:00am-5:30pm and features SKYWARN spotter training classes, exhibits and demos of weather instrumentation and radar products, keynote addresses by nationally-known storm chasers Tim Samaras (Twistex) and Chris Chittick (TornadoVideos.net), a storm chaser car show, amateur radio license testing, a technology expo, and more! Learn more about the event, including seeing a tentative schedule of events and list of appearances, by visiting the DASCCON-1 website. Click the logo below for more information. Second, FOX 13 will be presenting their 2nd annual FREE Mid-South Weather Camp on Saturday, August 4, from 9am to noon at Agricenter International. Parents or guardians can bring their 2nd through 6th graders for a Saturday morning of weather excitement just as the school year gets ready to kick off! Campers will be enjoying hands-on weather experiments and demonstrations and they’ll be able to visit with the FOX 13 weather team. Campers will also see exhibits and interactive experiences with hosts: the National Weather Service, the FedEx Meteorology Department, the Agricenter, the Shelby County Health Department, and the Shelby County Office of Preparedness. Children must be registered in advance - click the logo below to go to FOX 13's Weather Camp website to learn more and register! If it is anything like last year, Weather Camp promises to be a fantastic and fun-filled event! Feel free to share this information with friends and relatives in the area! Both events can accommodate a large number of people - the more the merrier! VERY HOT AIR WILL SPREAD INTO THE MID-SOUTH TODAY AHEAD OF AN APPROACHING FRONTAL SYSTEM. HUMIDITY LEVELS WILL ALSO BE QUITE HIGH LEADING TO DANGEROUSLY HIGH HEAT INDEX READINGS ACROSS MUCH OF THE MIDSOUTH. HIGH TEMPERATURES WILL RANGE FROM THE MIDDLE 90S TO 103 DEGREES TODAY. HEAT INDICES WILL RANGE FROM 107 TO 113 DEGREES. SLIGHTLY DRIER AIR WILL ARRIVE ON SATURDAY BEHIND A FRONT HELPING TO KEEP HEAT INDEX READINGS BELOW HEAT ADVISORY CRITERIA. 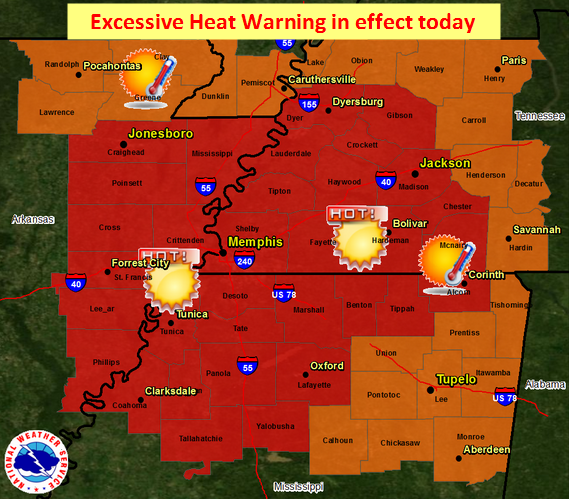 THE NATIONAL WEATHER SERVICE IN MEMPHIS HAS ISSUED AN EXCESSIVE HEAT WARNING, WHICH IS IN EFFECT FROM 11 AM THIS MORNING TO 1 AM CDT SATURDAY. * HEAT INDEX READINGS...BETWEEN 110 AND 113 DEGREES. * TIMING...BETWEEN 11 AM FRIDAY AND 1 AM CDT SATURDAY. * IMPACTS...HEAT RELATED ILLNESS SUCH AS HEAT EXHAUSTION OR HEAT STROKE ARE A REAL THREAT. DEHYDRATION CAN OCCUR QUICKLY. THE EFFECTS OF THIS HEAT WAVE WILL BE CUMULATIVE GIVEN THAT IT HAS PERSISTED FOR SEVERAL DAYS. ALSO REMEMBER TO CHECK ON THE ELDERLY AND THOSE WITHOUT INDOOR AIR CONDITIONING. REMEMBER, "BEAT THE HEAT AND CHECK THE BACKSEAT." DO NOT LEAVE CHILDREN OR PETS UNATTENDED IN VEHICLES FOR ANY PERIOD OF TIME. PROVIDE COOL WATER AND SHADE TO PETS AND LIVESTOCK. AN EXCESSIVE HEAT WARNING MEANS THAT A PROLONGED PERIOD OF DANGEROUSLY HOT TEMPERATURES WILL OCCUR. THE COMBINATION OF HOT TEMPERATURES AND HIGH HUMIDITY WILL COMBINE TO CREATE A DANGEROUS SITUATION IN WHICH HEAT ILLNESSES ARE LIKELY. TAKE EXTRA PRECAUTIONS IF YOU WORK OR SPEND TIME OUTSIDE. WHEN POSSIBLE, RESCHEDULE STRENUOUS ACTIVITIES TO EARLY MORNING OR EVENING. KNOW THE SIGNS AND SYMPTOMS OF HEAT EXHAUSTION AND HEAT STROKE. WEAR LIGHT WEIGHT AND LOOSE FITTING CLOTHING WHEN POSSIBLE AND DRINK PLENTY OF WATER. CHECK UP ON RELATIVES AND NEIGHBORS. IS AN EMERGENCY, CALL 9-1-1. A few weeks ago, we posted about the worsening drought conditions as we headed into a pattern in which temperatures topped 100 degrees on a daily basis. 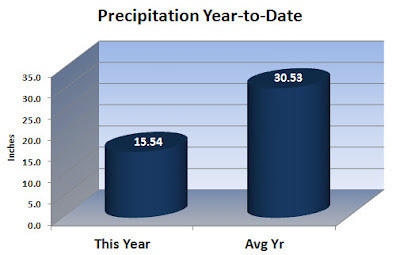 After last week's wetter pattern, how much did that rain impact the drought? Actually, very little. While it may have put a pause to the downhill trend, scattered showers on several days didn't make a dent in the rainfall deficit that the region has slipped into. In fact, according to the National Weather Service, the corridor from northwest MS to southern IL and IN has the greatest rainfall deficit of any region in the nation. Views of the nationwide departure from normal and a southeast U.S. regional view clearly show the major issue we are dealing with, sticking out like a sore red thumb. 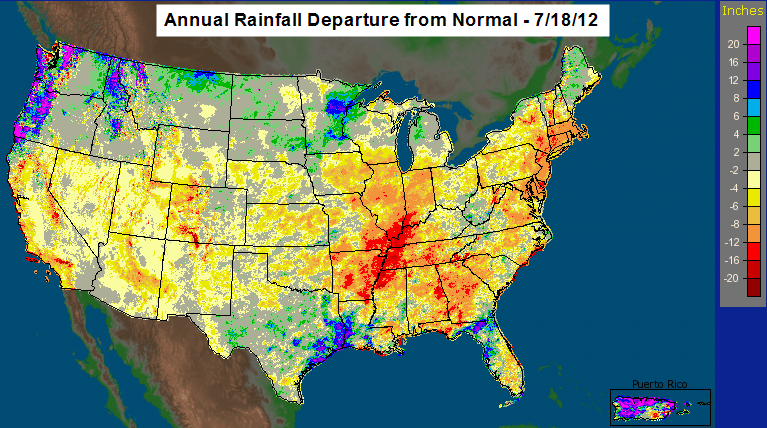 Year-to-date rainfall departure from normal. 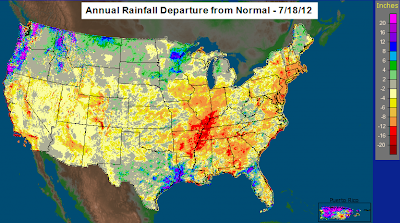 The vast majority of the nation has received less precipitation than a typical year in 2012. Courtesy NOAA/NWS. 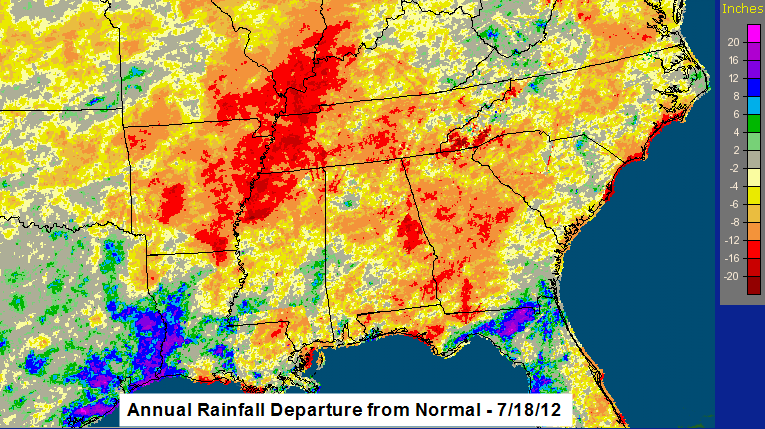 A closer look at rainfall deficits in the southeast U.S. The Mid-South is ground zero for rainfall deficits in the U.S. The lack of rain has had significant effects in many ways throughout the region, as well as the nation. Though many yards in the area may have greened up somewhat in the past week with some much-needed rain, the overall impact remains high as soil moisture content remains very low, waterways from streams and creeks to the Mighty Mississippi are at their lowest levels in years, and crops are withering from the combination of heat and drought. The Drought Monitor provides a scale of the degree of drought that is occurring in an area. Below is the condition of the lower 48 United States as published on the Drought Monitor. D0 means "abnormally dry," D1 is "moderate drought," D2 is "severe drought," D3 is "extreme drought," and D4 is "exceptional drought." As you can see from the chart above, over 80% of the continental U.S. is suffering from some degree of drought conditions, compared with just 37% a year ago. As far as any break from these conditions, Brian Fuchs, an author of the Drought Monitor, says "the dryness and heat wave pattern are still locked in. The latest forecast says this isn't changing. This could easily go on into September." Comparing conditions to last year at this time, you can see from the comparison graphic below that the degree of the drought is not nearly as bad as last year, but is far more widespread. The Southern Plains and Gulf Coast were in dire straits last year at this time, however it doesn't take an exceptional (D4) drought to cause significant impacts. Drought throughout the mid-section of the nation, coupled with a lack of snow this past winter up north, means that the Mid-Mississippi and Lower Ohio River Valleys, including their tributaries, are seeing extremely low water levels as well. In fact, restrictions have been placed on barge traffic on the Mississippi to keep the normally fully-loaded barges from running aground in shallow water. In order to keep the barges afloat, they have to carry less cargo and fewer barges can be pushed by one towboat. Dredging of the river bottom to deepen the water has also commenced in several areas to allow large boats to dock without hitting bottom and the dock for the riverboats in Memphis has temporarily shifted from Beale Street Landing to the cobblestones or even Greenbelt Park on Mud Island. The Mississippi River at Memphis, for instance, was at -7.2 feet as of 7am Thursday - a far cry from it's peak 14 months ago at 48.0 feet on May 10, 2011! The extremely low levels place the river gauge reading at #9 on the list of lowest water marks since records began. The record lowest stage is -10.7 feet set in 1988. The extended forecast (which does not consider the impact of future precipitation) brings the river dangerously close to the -10 feet mark by mid-August. The historic cobblestones and Mud Island with the river at -6.8' at Memphis. 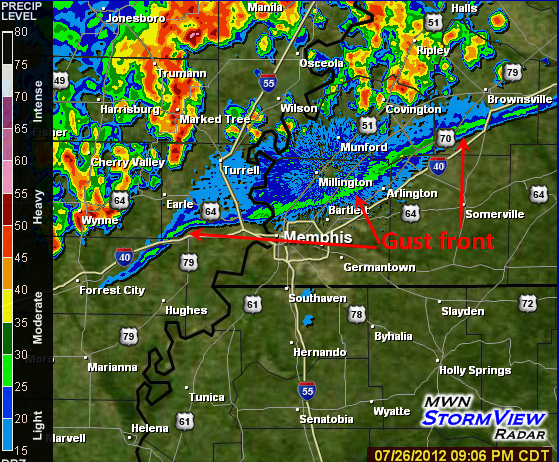 Photo courtesy NWS-Memphis. Due to excessive heat and abnormally dry conditions, the U.S. Agriculture Department has declared most metro counties federal disaster areas this week, including Shelby, Tipton, Crittenden, DeSoto, Tunica, and Tate Counties. This declaration means that farmers are eligible for low-interest, emergency loans designed to help them recover from crop loss this year. There are now almost 1,300 counties in 29 states designated as drought disaster areas. 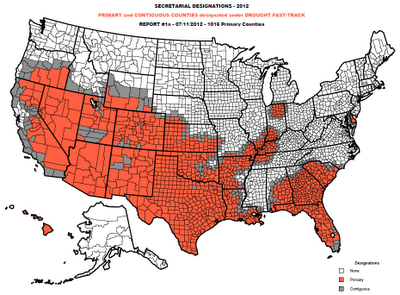 Areas declared as federal disaster zones due to drought (as of 7/16/12). Courtesy USDA. The widespread drought could easily result in higher prices at the grocery store later this year as crops wither in the fields and it costs more to operate the barges that transport the crops up and down our nation's major waterways. After a lengthy stretch of 100-degree heat and worsening drought, the region got a very helpful respite this past week as a large-scale pattern change brought increased clouds, rain chances, and cooler temperatures. While heavier rainfall was generally localized, and we’re still far off from breaking our severe to extreme drought conditions, the past several days did bring some short-term benefit. However, as surface and upper level high pressure rebuilds over the area, the heat and humidity are making a return in the days ahead, as one might expect during July in Memphis! As high pressure retakes control of the area, rain chances will be on the decline. While isolated thunderstorms are possible each afternoon and evening, the coverage of any such activity should be much more typical for a summer day with most remaining dry. With less rainfall and more sunshine, temperatures will rebound into the mid 90s. Though we don’t expect to see any 100-degree days, with humidity remaining elevated, the heat index will be an issue. Several days are likely to see heat index values top 100, and possibly 105, which crosses the “danger” threshold. Heat Advisories may be required by the National Weather Service, especially from Wednesday onward. 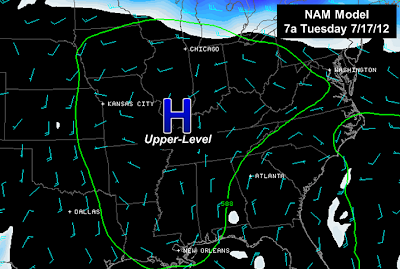 NAM forecast model for Tuesday morning shows upper-level high pressure rebuilding over the area. In terms of rain chances, one feature to watch this week for potentially more organized coverage will come into play Friday through Saturday as a cold front tries to approach the area from the north. The front will likely stall before it crosses the area, but it may serve as a focal point for more scattered thunderstorms. Even such, hot and humid conditions will likely persist these days as well. By Sunday, the front looks to wash out, and that will allow the hotter/drier pattern to become reinforced once again as we head into next week. After slowing in recent days, drought impacts will likely begin to accelerate again under this regime. GFS forecast model for Friday evening as a cold front approaches from the north. 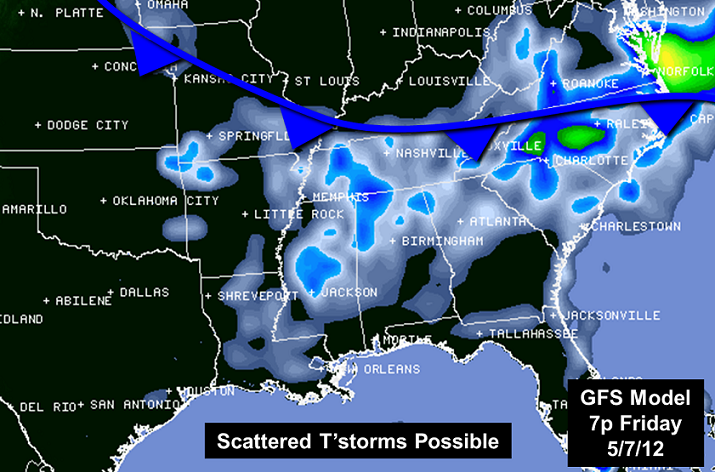 Scattered t'storms may result. With uncomfortable and potentially dangerous heat looking to return to the Mid-South this week, it’s a good time to remind you again the various safety precautions you should practice to prevent heat related illnesses from developing. 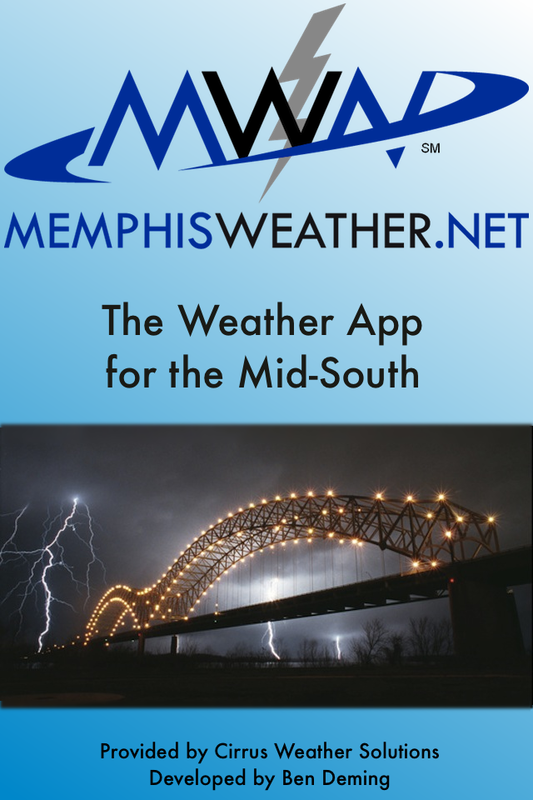 Check this previous MWN Blog post for all the details and be sure to stick with MemphisWeather.Net for all you need to know about Memphis area weather! Download our iPhone or Android apps - now with StormWatch+! MWN for iPhone users: Last night (July 11), we submitted a fantastic mobile update to Apple for the MemphisWeather.net app. We're proud to announce that StormWatch+ is getting a makeover! (Learn more about StormWatch+ here). While many of you have had great things to say about the app and the push notification-based alerting system we call StormWatch+ (and we appreciate those), the technology was due for an update. After working through several bugs over the past few months, as well as devising new features to make your experience with StormWatch+ even better, we are ready to roll out the next iteration of "personalized weather alerts in the palm of your hand!" This update will be available as soon as Apple approves it (typically 7-10 days). We'll also be working on a general interface refresh and new features as part of the base MWN app in the very near future with expected release this fall. MWN for Android users: We'll being working on these updates for the Android app imminently as well. We expect this release by the end of July, followed by the general design refresh and new features for the base app just as we do with the iPhone app. We're not ignoring you all! To download the MWN app for your iPhone, click here. You'll then want to purchase StormWatch+ for $3.99 within the app itself. 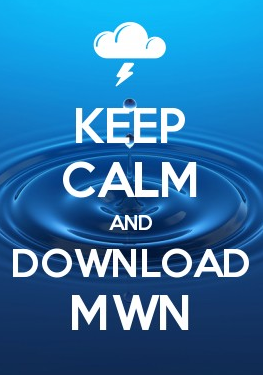 To download the MWN app for Android, click here. You can purchase StormWatch+ for $3.99 within the app. It's the week we've all been waiting for... No, not the series finale of American Idol or Super Bowl week. It's "Heat Relief Week"! For 2 weeks, massive hot high pressure has squashed rain chances and brought eight 100-degree days to the Memphis metro. Drought conditions have become "severe" (by definition) or worse as the last widespread rain fell on June 11-12 from a wind storm that seems like it was months ago. That ends today. A major pattern shift in the upper levels of the atmosphere has weakened the stranglehold of the persistent high the past couple of days, allowing for scattered thunderstorms to form. These upper wind pattern rotates around the high in a clockwise direction, which means our storms the past couple of days have been moving from east to west - backwards from what we typically see! Starting today, the high shifts back to the west and will be replaced by a trough of low pressure forming over the eastern U.S. This will allow a cold front to move into the Mid-South early this week. Upper-level pattern forecast for Wednesday morning (June 11) - high pressure has shifted west to the SW U.S. and is replaced by a trough in the eastern U.S., anchored by low pressure over eastern Canada. Note that the storm track (purple arrow) takes a dip into the Ohio Valley, much closer to our region. The front will move slowly, giving us multiple days with good rain chances, before stalling over north MS by mid-week. Abundant cloud cover and high rain chances will mean high temperatures will fall back to near 90 this week on average, with some locations remaining in the upper 80s early this week if enough rain falls. Total rainfall amounts this week should be nearly 2" for most locations in the metro, while some areas that get repeated thunderstorms could get more than that. Though it won't wipe out the rainfall deficit for the year (which stands at about 50% of normal rainfall), it will certainly alleviate it, especially for vegetation as well as agricultural interests. Severe weather is possible, though won't be widespread, this week. The main threats will be localized hail and some strong wind gusts in the stronger storms that form, mainly in the afternoon and early evening hours today through Tuesday. Looking a little further out, there are some signals that indicate the heat may return for the latter portion of the month, so enjoy the respite from it this week! Your lawns will appreciate nature's watering can better than yours and your wallet will appreciate your not having to run the sprinklers this week! Another above average month (temperature-wise) went into the books, though June was not as much above average as several previous months. However, cooler days to start the month were overshadowed by a very hot spell as the month ended. There were three daily temperature records tied or broken during the month, including the 25th (100 degrees - tie), 29th (103), and 30th (102). The high also reached triple digits (101) on the 28th, though a record was not set. 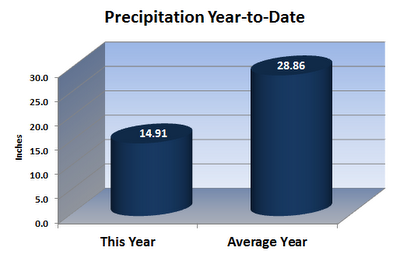 Precipitation was also well below normal with a total of 1.38" for the month - 91% of that amount fell on just 2 days! The metro is now classified as being in a severe drought, up from a moderate drought at the end of May. The average temperature for the month of June was 80.2 degrees, or 0.6 degrees above normal. The average high temperature was 90.6 degrees and the average low was 69.9. The coolest temperature of the month was 58 degrees on the 2nd, while the highest temperature was 103 degrees on the 29th (one degree shy of the all-time record for the month of June). There were 18 days in which the high reached 90 degrees or higher and 4 days in which the high reached 100. All below average daily temperatures for the month occurred in the first 2 weeks of June. Precipitation for the month totaled 1.38", which was 2.25" below average. 91% of the rainfall for the month fell on 2 calendar days (0.86" on the 4th and 0.39" on the 11th) and there was no rainfall recorded after the 12th. There were only 4 calendar days with measurable rainfall. The peak wind gust was 37mph (from the north in the wake of a derecho) on the 11th with an average wind speed for the month of 7.1 mph. Click here for a daily statistical recap for Memphis International Airport. Data from Cirrus Weather Solutions in north Bartlett is incomplete for June as the weather station was taken down for maintenance on May 21 and returned to service on the evening of June 5. The average June temperature at Cirrus Weather Solutions from the 6th through the end of the month was 78.8 degrees with a maximum of 102.2 degrees on the 29th and a minimum of 56.1 degrees on the 27th. June precipitation, augmented by a manual gauge used for the CoCoRaHS program for the first 5 days of the month, measured 2.14". The measured peak wind gust was 32 mph on the 11th. Average relative humidity was 67% from the 6th through month's end. Click here for a daily recap on MemphisWeather.net. For the month of June, the average temperature error in all MWN temperature forecasts was 1.36 degrees, besting all available computer model data. Nearly 85% of the MWN temperature forecasts for the month were within 2 degrees of the actual temperature. MWN's forecasts extend out five periods (or 2.5 days). For dewpoint accuracy, the MWN forecast averaged 2.66 degrees of error and fell within 2 degrees of the actual dewpoint nearly 60% of the time. Historical accuracy statistics can be found here.